At Gardenworks we believe you can have a dazzling garden without having to water it to excess. Our Certified Water Managers safeguard this precious resource by creating landscapes that use sound fundamentals of water-efficient design, water conservation, construction, maintenance, and management, whether we are creating a small garden or installing a landscape for a large property. One important method of efficient irrigation is to use a drip irrigation system where ever and everywhere you can. Why? Because drip systems apply water only where it is needed, which reduces evaporation and runoff. As a side benefit this type of watering also lowers the amount of weeds that sprout up. Drip systems are also typically easier to maintain and repair but can be more prone to damage and vandalism. You will typically find that a drip system will need to run longer per watering application but that the time between watering will lengthen and with less runoff and evaporation you may experience a lower water bill. Another principle to creating water-efficient landscaping is to limit the size of turf areas. The amount of water a typical lawn requires to stay green in summer can exceed the amount of water you’ll use in a year with a low water use type of landscape. We work with you to design lawn spaces only for the areas you and your family need for outdoor fun, and we’ll fill other landscape areas with pathways, groundcover, native plants, trees, flowerbeds, and hard scaping–all watered via drip systems. Remember: minimizing your green maximizes your green. Healthy soil is also fundamental to creating water-efficient landscapes. We will work to keep your soil aerated and enrich it with composting materials and other nutrients, which allow the soil to maintain its moisture and retain water. 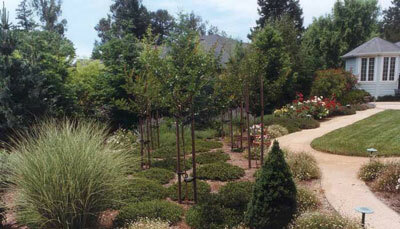 We are a California company so our credo has always been to recommend our clients adopt our philosophy of planting drought-resistant and regional or native plants. We also advise that clients avoid or minimize their use of high-maintenance plants, such as annuals or contain their use to smaller areas or pots. In the Santa Rosa area and the North Bay generally, our landscapers (and many of our clients) are also environmentally conscious. We avoid planting invasive species as they often find their way into other natural ecosystems. We also recommend and will spread out several inches of mulch in landscape areas, and we’ll do this on a regular or annual basis. Mulching is crucial to retaining moisture in the soil and prevents or slows weed growth. Wood chips and bark break down in the soil over time, which helps to improve the overall health of the soil. Finally, when we design landscapes for our clients, we work with them to create specific areas around patios or other high traffic areas where they can incorporate the plants and annuals they love. At Gardenworks we love plants of all colors, temperaments, shapes, and sizes but we also want to work with you to preserve the water resources in your community. You can have the garden you love without costly or wasteful water use. Contact us today to see what we can create for you. A major benefit of a garden designed and built for water use efficiency is a lower overall cost of maintaining it into the future, both in labor and resources. Couple this efficiency during the building phase with an appropriate water budget that is met by proper water management during the life of the garden–the result is sustainable and green. If you’re still hesitating on whether to make the investment for your property, however, consider these Benefits of Designing Your Landscape for Water Efficiency. If you’re ready for easier landscape maintenance and lower water bills, talk to the experts at our Gardenworks Water Management division.